← Finally Ice Off in FSJ! Well last time out in my tube, post ice off, did the trick in releasing the winter doldrums. It just felt good to be into some fish. Last weekend the plan was to take the “River Wolf” and drop it into a lake that had bigger fish. The thought of standing up on my bow, using it as a casting platform, and targeting cruising fish in the shallows had me wired for sound. The weather had been crappy all week with the last two days under a heavy rainfall warning. That was going to change on Friday and with the barometer rising fishing could be stellar! So Thursday night saw me in the basement rigging rods and changing over to 7.7 lb flurocarbon leaders. I wanted to leave early so everything was ready at the door when I hit the hay. Well almost everything. I was having a nice deep snooze when I woke to … well I’m not sure what it was. It was loud and in my foggy state I looked out the window to see what was going on. Remember that rain alert well mother of ten it was a wall of water outside. Might as well been deep in the Amazon or in a typhoon in India. I lay back down listening to the pounding water outside and tried not to think what this would do to the road into the lake. Twenty minutes later it stopped and I drifted back into a fitful sleep. The alarm went off at ten to five and I rolled out of bed to see that the pavement was almost dry. I loaded the jeep, hooked onto the boat and went in to do a walk through of the basement in case I missed something. As I was coming upstairs in the back of my mind a word was forming … NET! I went to grab it but it wasn’t where it should have been. I looked everywhere then did what every guy eventually gets around to which was wake the wife and ask” Do you know where my net is?” Not missing a beat as she rolled over and snuggled deep under the blankets she said” Right where you left it” I know when to leave well enough alone so I kissed her on the cheek and headed out the door. As I pulled out of the driveway I briefly toyed with the idea of stopping at a buddy’s place down the street. But a vision of his wife standing in the doorway ( as he surely wouldn’t be getting up ) asking me what the hell I wanted at 5:00 AM kept me driving right past. The drive into the lake really wasn’t that bad as I don’t think they got the rain that came down in FSJ. Having said that I still had to spend 15 minutes on the boat ramp washing away all the mud inside before I put in the plugs and launched. I wasted no time, shooting over and onto the massive shoal. There are a bunch of deeper holes that have produced well in the spring so once I found one I anchored about 30 feet away. I was fishing in 6 to 7 feet of water running the usual suspects under an indicator. There was around a 15 KM wind so the ripples and waves kind of put a kibosh on the sight fishing. With no fish showing I bounced around the flats trying chironomids, bloodworms, mini-leeches and shrimp without any luck. Time to change her up so I tried everything again but out along the drop off. On the bright side I now saw a few fish rolling on the surface. As my indicator bobbed I cast a type VI sink line with a short leader and a floating dragon pattern out into the deep water and crawled it up the drop off. One tap in an hour and it was onto plan C. I remember thinking I sure hope I don’t have to go through the whole alphabet to get a fish. Plan C was to drift the drop off as the wind was blowing parallel to it. I grabbed a rod set up with an intermediate Camo line but snipped off the leech attached as they hadn’t worked up until now. This is where you always second guess yourself after trying 10 or 12 flies with no luck. I was kind of staring blankly at an open box of chironomids and leeches when I spotted three lonely water boatmen hiding under some marabou. I remember buying them right off the counter in Wholesale Sports in Kamloops when I was down late last summer. I haven’t bought flies in over 15 years but they looked cool and were quite a bit different then the patterns I had tied. As I stared at them I told myself,” you know fishing water boatmen isn’t just for fall”! So on one went. I put the boat in position, killed the motor and started Cast … Drift … Strip … Cast … Drift … Strip. About 10 minutes in and I had a violent strike. 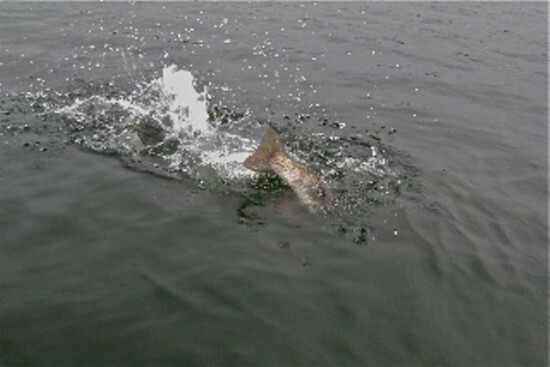 The fish veered up and onto the shoal into the weeds an PING was gone. Then there were two boatmen! I reeled in and thought about some other big fish in this lake that had done the same thing to me before. Off came the 7.7 lb and on went some 9.2 lb flurocarbon leader. Ten minutes later I hooked into a nice silver Blackwater around 18 inches that had supper written all over it. She had other ideas. Remember earlier I mentioned no net, well this one flipped off by the boat. I hooked a couple more rainbow of similar size and lost them all at the boat. Bright side still had the fly. On my second drift I hooked something a little bigger that dogged it down deep. Yup a nice 2-3 lb Brookie that just prior to getting filleted spit the hook. It was at this point I promised myself that first thing Saturday morning would find me buying a F-ing net! settled on was a huge bird nest in my leader! What had been around 12 feet of leader was now 5 feet with a mangled mess of fluro and mono a foot down from the fly line. I was trying to figure out what had gone wrong with my flawless casting skill. Oh yea I’m not a flawless caster! While pondering this mess the fish rolled and was gone on a good run. I was at the mercy of the wind and prayed the fish would stay out of the weeds Please. Knowing the odds of landing this beast were slim I fumbled to get the camera handy for any shot I could get. It came up from under the boat and for a second I thought I could tail it. My fingers didn’t touch as I grabbed the tail and it just shot off on another run. The wrist of this fish’s tail was bigger than my wrist. She surface a couple more times and I tried to get a picture but got nothing to do this fish justice. … the big girl making another run! My final seconds of the fight it came up under the boat again and I was stripping like crazy. Next thing I know there’s the birds nest, she runs under the boat and Ting gone. Took the boatman, 3 inches of leader and booked it. I’m sure she’ll scrape that barbless hook out of her lip soon enough. Two things ……. Don’t get locked into chironomids and leeches in the spring remember boatmen. I had 4 hours with nada then 3 hours of steady fishing with one; AND MAKE SURE YOU HAVE A NET! 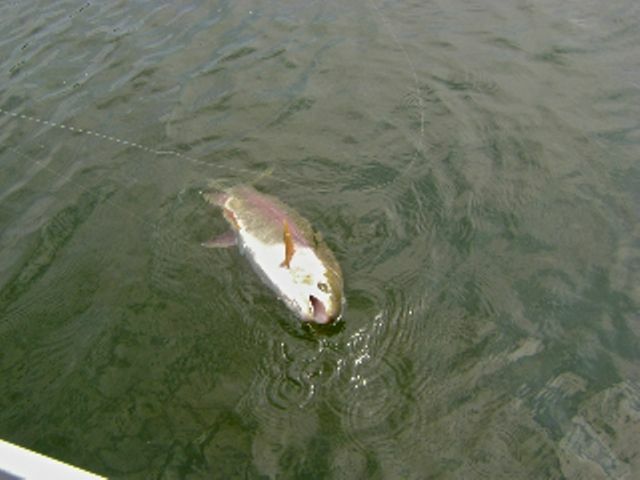 Gord FlyGuys Northern Division … Keep Calm, Fish on! Hey Dan what I forgot to mention in my PM was that I strongly beleive in boatman patterns with flash. Body or trailing. My favorite pattern at the moment is the Herling Silver Boatman. I’m sure they still sell them at Wholesale Sports in Kamloops.